Cricket likes to think of itself as more than a sport. There's something called The Spirit of Cricket which is about a spirit of fairness and respect for all involved in the game - your opponents, your team, and the community in which you play. It's a sport that brings together people around the world from backyard and beach matches to club cricketers to Test Matches at the apex of the game. And over time, it is not too melodramatic to say that it has helped bring together and heal communities. One of the most eloquent expressions of this is Sri Lankan batsman Kumar Sangakarra's MCC Spirit of Cricket lecture in which he tells how cricket unified a country riven by civil war. 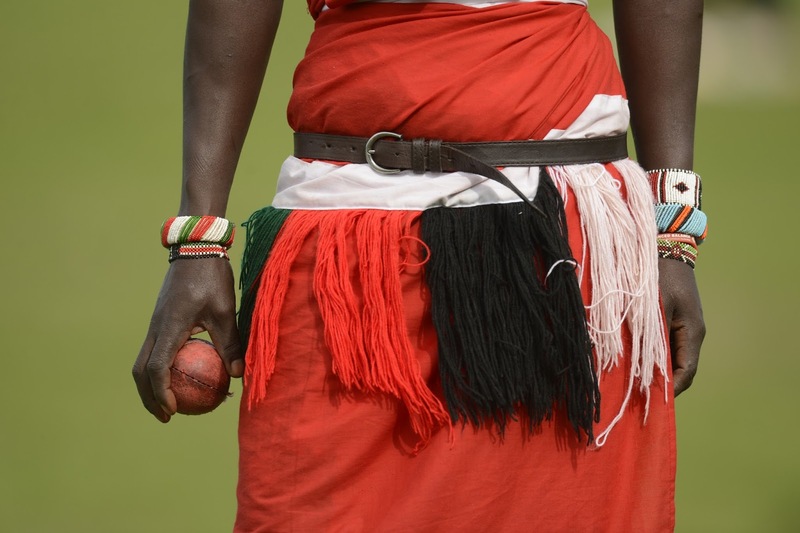 But cricket can have a positive influence far beyond the Test playing nations, and in his new documentary, director Barney Douglas shows how cricket is helping to change lives and attitudes among the Maasai community in Kenya. What's more impressive is that this deeply moving story is told with wit, passion and some of the most stunning cinematography seen in a sports documentary (not to mention a superb sound-track). It's a movie with an important message, but it never feels ponderous or hectoring. The message is elegantly woven into a classic underdog story that leaves a lasting impression. WARRIORS begins in the Maasai community where the young men, dressed in traditional clothing as befits their role as the warriors of the title, take up the game of cricket under the direction of an inspirational South African coach. Until the British Army come in and bulldoze a playing field for them, they barely have anywhere decent to play, and they don't have proper equipment, let alone an opposing team! But somehow their enthusiasm wins through to such an extent that even the village elders in this deeply patriarchal society acknowledge that this cricket is something to be embraced. Soon the team has made it into an international competition for club cricketers in England, even making it to play on the hallowed turf at Lord's! It's absolutely fantastic to see this team, still dressed in traditional clothing but with the aid of some proper bats and pads, face conventionally dressed club teams from around the world. At the start, it's almost embarrassing to watch them face actual opposition but soon they're in the swing of it and you can feel the audience will them to win their first match! This underdog story makes the film relatable beyond the cricket fandom, and my companion, an American who hates all sport, was gripped by it. But underneath the uplifting story of a team triumphing against all odds is an even bigger story, of the newfound respect they gain in their home community and the brave discussions their captain leads with the village elders. These are young men, after all, who have left home to study in Nairobi and have flown on planes to Europe. And while they respect their traditional culture, they can't help but see that it's patriarchal prejudices as unfair to the women of the community. And so we come to a deeply serious conversation about female education, forced marriage and most importantly the practice of female genital mutilation. This might all sound like a very odd mix but what is truly great about this documentary is that manages to balance the fun with the serious - the sports story with the social context - in a manner that is in the best tradition of cricket. It makes this film about so much more than just a game and one of the more important and compelling documentaries released this year. WARRIORS has a running time of 86 minutes. We really appreciate for all the supporters regarding Warriors Film.